And One: Heel Flat movement of the left foot as it goes forward In the line of dance: put the Heel down on the And count and Flat on the One count. Keep this step small. Turn 90 degrees CCW facing the wall as you make this step. Two: Ball movement of the right foot as you move sideways in the line of dance, landing on the Ball of the right foot. Keep the heel of the right foot up, also during the next step. This should be the largest step in this dance. Shift your weight to the right. And-Three: Ball Flat lock step movement of the left foot: with your weight on the right and pivoting on the right foot, slide your left foot in front of your right foot, landing on the Ball on the And count, then Flat on the floor (heel down), on the Three count. Turn between 45 degrees and 90 degrees CCW while doing this step. And-Four: Ball Flat movement of the right foot as you move your right leg back in the line of dance, landing on the Ball first on the And count, then Flat on the floor on the Four count. Keep this step small. Turn 90 degrees CCW facing the Centre (your body should twist from the waist down) as you make this step. Five: Ball movement of your left foot sideways (parallel to the line of dance) landing on the Ball of the left foot. Keep the heel of the left foot up, also during the next step. This should be another large step in this dance. Shift your weight to the left. Six: Flat movement of your right foot: drag it on the floor towards your left foot, ending next to it. Turn 45 degrees CCW while doing this step. The Flat movement is to ensure that you don’t rise during this movement. 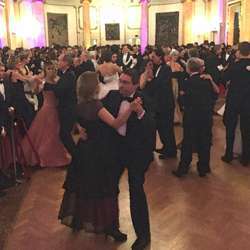 Remember, no rise and fall in the Viennese waltz. If any of the above is not clear and you have questions, write it down and take your questions to the dance class. We’ll repeat the moves often but try also to practice at home!